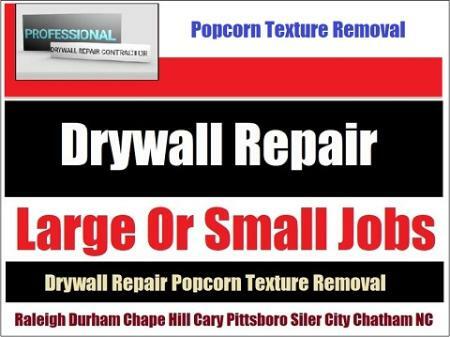 Chatham's Top Drywall Repair Contractor. Call Drywall Specialist a leading professional with years of repair experience. Affordable prices and free estimates on large or small repair and restoration jobs in Pittsboro, Siler City And Chatham County, North Carolina. Chatham County NC: 27207, Bear Creek. 27208, Bennett. 27213, Bonlee. 27228, Bynum. 27252, Goldston. 27256, Gulf. 27312, Pittsboro. 27344, Siler City. 27559, Moncure.